F our hundred years after his life, St. Augustine is one of the greatest minds of all time and is in the Theologian Hall of Fame. He understood God as Trinity and was obsessed with the idea. He wrote seven books about the Trinity; no little paperbacks - big, thick books. At a time when he was writing still another book about the Trinity, he was walking along the beach in the Mediterranean where he saw a child running back and forth from the sea to a hole he had dug in the sand. 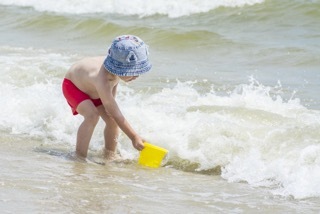 The child carried a bucket; filled the bucket with seawater and dumped it into the hole he had made. He did this over and over and over again. Augustine asked him why he was doing this. The child replied, "I'm trying to put the sea into this hole." Augustine responded, "You can't do that. It won't fit." The child, who was an angel in disguise, said, "Neither can you put the Mystery of the Divine into your mind. It won't fit." So, how about you? Are you trying to put the magnitude of the Divine into your mind? No wonder things come so hard. Even Einstein believed there were things bigger than his mind; things he could never understand. The true call of those of us who want to understand is not to try to reason everything out, but instead, give the toughest things over to our heart. It is the call to shift from reason to faith. Now don't tell me you don't have faith; the human character depends on faith. How many times did you just go ahead with a decision without knowing exactly how things would turn out? Faith! How many times do you jump in your car not worried about arriving at your destination safely? Faith! Faith is the unnamed characteristic of our existence that helps each of us take risk in life. Why did you make that decision? Why did you take that risk? You just knew it in your heart! Many will say that they look at all the angles and calculate the outcome before they make the final decision to go ahead or not to go ahead. They figure it all out through their ability to reason. Well, in all reality, the times I have worked the decision in my mind; reasoning every angle with the pencil and paper or a fancy calculator; the outcome was not what I had expected and certainly not what I had planned for. You just know in your heart when something is meant to be. You just know! When that happens, you are demonstrating a faith in something you don't totally know. Faith is the thing hoped for, but yet unrealized. You see, faith is part of our daily life; it plays a role in every action we take, from the time we rise in the morning until the time we go to bed at night. It even takes faith to believe we will wake up in the morning! There is a parable that tells of the person who received one talent and went and buried it because he was fearful of losing it; he did not have faith. Another person received two talents and went and shared them with the faith that they would multiply when put to good use (Matt. 25). Remember, while the mind is calculating, the heart proliferating. We need both, but the one we lead with determines the outcome or our lives. Are you leading with your mind and following with your heart, or leading with your heart and letting life be confirmed? Success of life is calculated by the mind while the meaning of life is calculated with the heart. What you are truly capable of will be determined in your heart! Thom shares why traction is so important on the journey of self discovery.